Want to Buy a Viola? If you wish to buy a viola, maybe your first viola, you're probably wondering where to start. With so many online auction sites available, you've probably seen inexpensive violas and wondered if they're worth the investment. Likewise, you may be wondering if it's a good idea to purchase a so-called student-size viola as your first instrument. The viola may be one of the most misunderstood instruments in the orchestra. Many people think of it as an over-sized violin, but the viola has a beautiful, haunting quality all its own, as you may have realized if you've visited other pages of this website and listened to some music. Just as the violin is considered to be the soprano of the orchestral string choir, the viola is the alto. Its rich, sonorous tones lies, in quality and timbre, halfway between the violin and its tenor counterpart, the cello. For beginning students of all ages, many viola instructors recommend purchasing a student-size viola rather than a full-size instrument, although there is not such thing as a "standard viola size", so read how to choose the right viola size for you. Also known as a three-quarter size (12 inch/30.5 cm), a student viola is smaller, making it easier for a beginner's fingers to maneuver up and down the fingerboard. A three-quarter size also has a slightly shorter body, which makes practicing bowing easier. 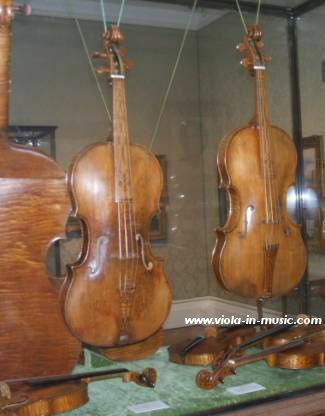 There are also other sizes for student violas: 13 in (33 cm), 14 in (35,5 cm) which is about the size of a violin, 15 in (38 cm), 15 1/2 in (39.5 cm). How much will it cost to buy a viola? It all depends on how much you are prepared to spend. Anyway, when you decide to buy a viola or any acoustic string instrument, it's important to try to steer clear of those ultra-cheap instruments that are manufactured overseas and sold online for almost incredibly low prices. Experienced players refer to these as "wall hangers" because it's so unsatisfying to play them, they sound so horrible, that you'll end up hanging them on the wall, for decoration, and never touching them. These cheap instruments may be affordable, but in the end, they're a terrible investment, because they break apart, don't last and often provide a traumatic learning experience because they're constructed poorly and are difficult to play. They're also made of inexpensive laminates instead of solid hardwoods, so their tone is usually thin and weak. On the contrary, the top of a quality viola will be made of an excellent resonant wood such as spruce, because the top serves as the instrument's sounding board. With a well-constructed, quality spruce top, a viola will be loud enough to cut through the orchestra, yet should have a tonal warmth and sweetness, typical of the viola, with a smooth balance between the upper and lower registers. For advanced students and performers, there's simply no question about the superior quality of luthier-made violas versus mass-produced models. A luthier-made instrument is hand-constructed and finished by a master craftsman. It has tonewoods that are impeccably chosen, shaped and carved so that the instrument will have the perfect balance of darkness in the lower register and brightness in the upper register. From selecting the right tonewoods to applying the proper amount of varnish, a luthier is experienced in every aspect of the building process and strives to create a top quality custom instrument that can be played with pride by any professional in every type of venue. If you're interested in playing your viola with a pop, rock, or folk ensemble, it's extremely easy to add an acoustic pickup to an acoustic viola. 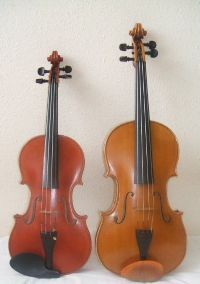 Companies such as K&K and other well-known manufacturers make both single and dual pickups for acoustic stringed instruments such as guitars, violins, violas and harps. Likewise, you might also want to invest in an electric viola, which comes with its own internal amplification. Be aware, however, that an electric viola is not generally used in classical orchestras but is primarily used in pop, rock and jazz venues. Whether you're looking at an online sellers such as Dawsons Music or researching reputable luthiers, it's important to do your homework before you buy a viola or any string instrument. It also will help tremendously if you can recruit a viola teacher or performer to come along with you when you try out violas. An experienced professional can help you find the perfect viola and the more you love your instrument, the more you'll end up playing it and enjoying it. Click here to receive the Viola Calendar, with daily micro viola news and special offers!